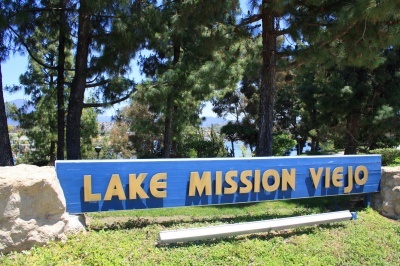 The Mission Viejo Lake, is a reservoir located about 5 miles south of the Santiago Peek ( it offers beautiful views of it) and it's a man made lake, which is not fed by runoff, and it's maintained to be safe for contact and swimming. It has two man made beaches, one located on the north end ( North Beach or Playa del Norte) and another one on the east end of the lake (East Beach or Playa Del Este ).The lake is surrounded primarily by private residential (single-family homes and condominium) communities often known as the Mission Viejo Lake Homes or 'Lake Area' neighborhoods, which makes access to the lake more difficult to the public. Tres Vistas and San Marino Estates are guard gated luxury waterfront homes with their own dock and private beach. The condominium communities of Mallorcas and Finisterras on the Lake have their own private beach and clubhouse. There's also the communities of Andalusia and Madrid del Lago that are lake close and considered "Lake Area" neighborhoods, some homes here will boast beautiful lake views. Tres Vistas, San Marino, Finisterra on the Lake and Mallorca condos are the only ones that will have some lakefront properties. Read more about the Lake Mission Viejo Real Estate. Below you'll find all available Mission Viejo Lake Homes. For more information about any of these homes, contact us. Read more about the Lake Mission Viejo Real Estate and its communities, homes and condos. Tres Vistas and San Marino are custom homes, some on the lake, very popular. Finisterra on the Lake and Mallorca are condominiums and townhomes. Mallorca is gated community that is more impressive and elaborated than Finisterra but both communities offer a clubhouse and private beach. There are also several communities on the hills around the lake that feature dramatic views of the lake. Two of which, Canyon Crest and Vista del Lago are highly desired communities of Mission Viejo.